Using multigrain flours to make rotis is a very healthy option and adding flax seed powder makes them more healthier. I have started incorporating flax seed powder in some way or the other in my daily cooking. 2. Knead to make a soft dough using water or milk. Apply oil and rest the dough for 10 minutes. 3. Divide into small balls and roll them into rotis. 4. Make them on the tawa / griddle like normal rotis. 5. You may also puff it on the gas flame when the roti is half done using tongs .Apply ghee and serve hot as these might become a little dry if you keep them longer. Thanks for trying my recipe and linking it to the event. I add flax seeds in my rotis often, they looks fabulous. I will start adding this in my rotis now, it doesn't change the color of the rotis right? i dont like brownish black rotis thats why. 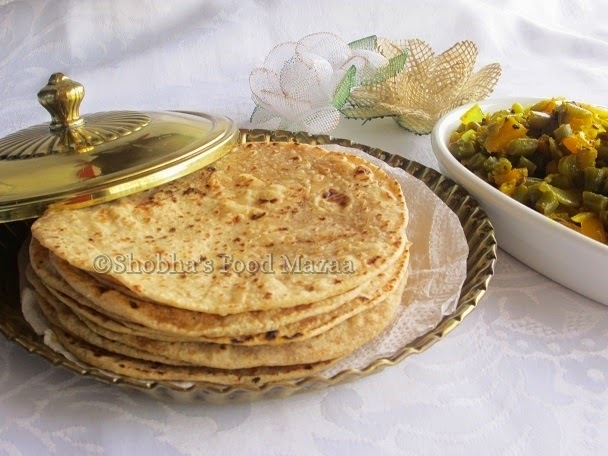 Delicious multigrain roti that too with lot of healthy flours. Thanks for sharing with Hearth and soul blog hop. I have never thought of adding flaxseed powder to my roti flour. I add soya flour, millet flour, oat flour, rajgira flour etc but why didn't I think of flax seed? Will do so immediately. I add soya flour to my rotis but never thought to add flax seeds. Very healthy idea. You can add now on..